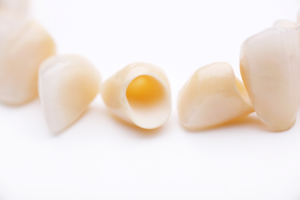 Over the years, there have been several improvements to the materials used to create dental crowns. Now, porcelain is often the preferred material because it can be customized to make the crown look like a natural tooth. In addition to an improved appearance, it also remains strong and durable. On average, a dental crown will last for about 10 years before needing to be replaced; however, it is not uncommon for them to last for as long as 25 years with the right care. To promote the longevity of your dental crown, there are several things you can do at home. Although it is not subject to tooth decay, you will still need to care for it when brushing your teeth. In addition, do not forget to floss around it every day to remove plaque and bacteria accumulations from around the gum line. Although crowns are strong, they can become damaged. To prevent one from breaking or cracking, it is best to avoid certain habits, like grinding or clenching your teeth. If you cannot break the habit, your dentist in State College may suggest the use of a mouthguard. It is also best to avoid other behaviors that may cause it to break, like chewing on overly hard foods, such as ice. You should not use your teeth as tools, like to open packages, and do not bite your nails. How Do I Know If My Crown Needs to Be Replaced? If your dentist has suggested that you receive a dental crown, choose a location that specializes in the procedure while also using the latest technological advancements. This will help to ensure its long-term success to protect your investment. Donald Marks Family Dentistry provides a patient-focused practice to help you achieve optimal oral health. Our highly skilled team uses the latest innovations in dentistry to provide superior care. If you need a dental crown, we will provide you with the restoration you need. Contact our office today to schedule a consultation. by: Dr. Donald Marks at May 20, 2018 .